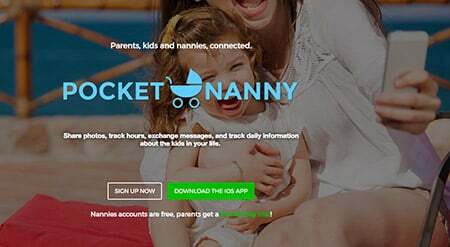 Cubby Notes, a Dover-based service that improves childcare, has launched Pocket Nanny, a mobile app that keeps parents and nannies connected during the day. Pocket Nanny includes an hours tracker that calculates pay (including overtime), group messaging, photos, daily information tracking and more. "Its basically a mini social network, focused around your kids, and private to parents and nannies," said Founder and Developer Dave Coffin. "Things become so scattered, especially when you have multiple people involved. There are a lot of times it’s really important everyone is up to speed," when caring for infants and young children. The app provides a single place for all related information and communication, said Coffin. Cubby Notes started with an app of the same name geared toward childcare centers. New parents Dave and Jen Coffin developed it to better communication between their daughter's childcare center and parents. Now, several childcare centers on the Seacoast use the app, Coffin told NH Business Review. Last year, Cubby Notes participated in Alpha Loft's Accelerate NH program, which helps startups prepare their products for launch. As a developer, Coffin had no problem writing the coding for the app, but said the program helped turn his and his wife's idea for Pocket Nanny into a business. "They continue to have resources for us and experts if we have questions, but I was really naive about the whole business world before and they really put it into perspective and gave us access to best practices and to better anticipate problems that would arise in that realm so a software developer could actually make a go at starting a business," said Coffin. After completing the program, Cubby Notes was announced the winner Live Free and Start's Ultimate NH Connection tech startup competition. The Coffins met with Gov. Hassan and industry leaders, receiving feedback that resulted in the final Pocket Nanny. "It was an intense half a year of learning how to create mobile applications and jumping through the hoops of getting it in the app store, but we’re happy to announce that it is available and getting rave reviews. We’re so excited for the future, and cannot thank Live Free and Start and the Ultimate Connection Challenge for affording us the confidence, advice, and connections to move forward with our business with fresh optimism,” said Coffin. The app is currently available on Apple products with the intention for an Android-friendly app in the future. The app can be purchased here.